Rakhine State is the home of Myanmar's Rohingya Muslims, a group often described as one of the most persecuted minorities in the world. Traveling through this region is an exercise in restriction, but also revelation. It's clear the current policy settings of international governments have been ineffective in stopping the persecution of the Rohingya. We need to reset. Part of that reset may mean considering the unsavoury and difficult option of opening direct dialogue with the Tatmadaw, the Myanmar Armed Forces. Part of the reason why policy has not advanced is the lack of access to the Rohingya in Rakhine State, where inward and outward movement is tightly restricted. Traveling anywhere beyond the immediate township of Sittwe requires a travel authority issued by the government which may or may not be given. Special permission is required to work and visit camps for internally displaced persons (IDP), where most Rohingya Muslims have been forced to reside since 2012. There is a blanket ban on all media. The villages in northern Rakhine State, where some of the worst abuses by the Burmese military have been documented, are a no-go zone, except for a limited number of NGOs. Recently, however, I had an unexpected opportunity to observe conditions in the IDP camps in Rakhine State on a delegation sponsored by Save the Children. 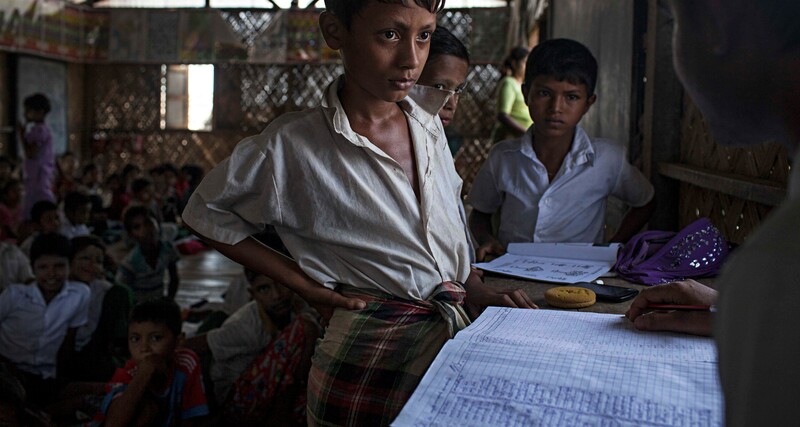 Save the Children is one of many international aid organisations that not only provide basic services in the IDP camps but also administer health and education aid throughout Rakhine State and the rest of Myanmar. It became clear to me that the continued presence of IDP camps is not only a humanitarian disaster; they also compromise the very difficult and necessary work of international aid organisations. The IDP camps in Rakhine State are, in the plainest of terms, government-sponsored concentration camps for the country's Rohingya Muslims, a group that is essentially stateless. Though the Rohingya have been persecuted for years (considered to be 'illegal' migrants from Bangladesh, denied citizenship since 1982 and the target of repeated waves of attacks), it was the last episode of state-sponsored violence against them in 2012 that confined the survivors of these attacks to the camps. Just as outsiders are not allowed to enter without permission, the occupants of these camps are not allowed to leave without permission. That permission is rarely granted, thus denying access to schools, markets, hospitals or even basic health services. After establishing these camps and forcing the Rohingya population into them, the military and government abandoned all responsibility for administration and provision of services. This task is now left to a coalition of international NGOs. The Myanmar government is essentially conducting ethnic cleansing, hoping that the inhabitants of the camps will dissolve back into the earth and the remaining Rohingya in villages will die or cross into Bangladesh. International NGOs are left to pick up the pieces. The continued presence of the IDP camps is not only morally fraught but hinders the effectiveness of the broader international aid work in the country. There is little public sympathy among the Bamar, the dominant ethnic group in Myanmar, who view the Rohingya as Bangledeshi and therefore non-citizens, and there has been a violent backlash against aid agencies for their work in the camps. This puts aid organisations in a difficult position, as they are perceived to have sided with a hated minority in a sensitive ethnic conflict. The Bamar Buddhists in Rakhine rightly point out living conditions in surrounding rural villages are little better than in the camps, and claim the Rohingya have taken all the international community's attention and resources. Paradoxically, the more the international community pushes to assist the Rohingya through current strategies, the more it might inflame communal tensions, thus feeding the cycle of resentment and violence. Never mind the fact that the aid agencies are also funnelling significant resources to surrounding villages in the Rakhine State – perception matters. The longer these camps stand, the stronger the precedent is set that international aid organisations are responsible for this vulnerable group. International aid organisations are caught in a conundrum: they have to respond to the humanitarian imperative of assisting the Rohingya but, by doing so, they allow the government to abrogate responsibility, as evidenced by the refusal to grant citizenship. International aid organisations have in some cases purposely not established permanent infrastructure in these camps so that they don't acknowledge and encourage their permanency. In many other instances, their work has been blocked by corrupt camp management committees. But five years on, the camps remain and the people inside them continue to suffer. Conditions inside the camps are restrictive, dire and undignified. Malnutrition, poor sanitation and violence abound. The work of international aid organisations needs to be supported not only through continued and increased funding, but also politically, through smarter development and foreign policy towards Myanmar, so aid organisations might extricate themselves from this Catch-22. Increases in development aid must be tied to incentives to close the camps, so that Australian and all international aid can be more effective. As it stands, the presence of these camps and the work international aid organisations are committed to doing to help ease the suffering of the camps' occupants is another exercise in restriction, in that it affects the efficacy and focus of their broader aid work. The camps must be dismantled and the Rohingya integrated back into regular life in Rakhine State. If this is not done, the continuation of these camps will directly hinder the principles of the Paris Declaration on Aid Effectiveness, as applied to aid in Myanmar. So long as this aid goes towards unacceptable policies such as the existence of internment camps, development will remain stalled. There should be a very clearly articulated foreign policy objective to shut down these camps, not just a vague 'resolution of the Rohingya issue'. Australia needs to think more strategically and realistically about better approaches to pressure the current government to close the camps. Currently we are pressing the wrong pressure points. Appealing to State Counsellor Aung San Suu Kyi and the NDP Government is not working because she cannot control the military, and it is the military authorities who drive actions and policies towards the Rohingya. She cannot go against the sentiments of the majority population who are hostile to the Rohingya, for fear of losing broader legitimacy. Grassroots advocacy among the broader Burmese community is not working because there is little interest or sympathy for the Rohingya's plight when the broader community also live in poor conditions. Having no direct dialogue with the Tatmadaw in order to preserve the illusion of authority of the NDP government may make political sense, but it also compounds the cycle of ineffectiveness. Threatening to withdraw aid is also counterproductive, as Myanmar authorities appear nonplussed by the prospect and would likely continue their slow campaign of ethnic cleansing. New thinking is needed. Rakhine State is the poorest state in Myanmar. The state itself is in dire need of additional aid. We need to incentivise the government to spend more of their own budget on health and education in Rakhine and throughout the country through promises of additional aid in exchange for closing the IDP camps. We also need to consider opening a direct dialogue with the Tatmadaw. We must be willing to hold our noses and deal with the military generals, offering carrots as well as sticks to incentivise the military to close these camps and stop human rights abuses. Australian and international foreign aid policy must be based on an understanding of where the military's economic and political interests lie and how to use these as leverage. It must be based on an analysis of what is driving the military forces to use the Rohingya as a trump card in their continued bid for control, despite their nominal commitment to Myanmar's democratic transition. Aid policy cannot be divorced from other monetary flows into the country, particularly private capital, of which the Tatmadaw is the greatest beneficiary. Incentivising instead of punishing those responsible for abuses will be a bitter pill to swallow, particularly given the horrifying abuses laid out in a OHCHR report last month. But while aid is a humanitarian imperative, it also involves difficult, realist choices. We cannot be purists if we want to be effective – for the sake of all those left to languish in camps, those persecuted in villages, and for the future development and democracy of Myanmar.